Our new Android Recovery Stick is a revolutionary new product designed to recover deleted data** from Android Phones*. 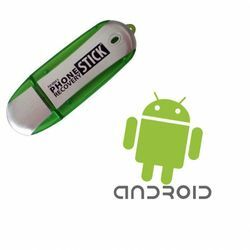 The Android Recovery Stick is a thumb-drive USB device that will help you recover deleted data as well as other data from your Google Android phone. Simply connect the cell phone to any PC with the phone's data cable and then connect the stick to the same computer through a USB port. Once the two devices are connected; run the built-in software on the Android Recovery Stick and recover the data you are looking for with the click of a button. The data recovery process may take several hours to complete. However, the Android Recovery Stick is capable of recovering text messages that have been deleted as well as all sorts of other user data such as call logs, images, contacts, etc. Because of its versatile recovery capabilities and easy-to-use interface, the Android Recovery Stick is ideal for professionals who have accidentally deleted important files, employers who have issued cell phones to employees for business purposes, concerned parents, or anyone who may have a need to retrieve a deleted item from an Android smartphone. *Please Note: You must have the PIN for locked phones before performing a recovery. Please click HERE for a list of compatible devices.